Q: How brave [grave] is the threat of piracy today compared with, say, the time frame around the Captain Phillips kidnapping? A: I would say it is more prevalent. On a global scale, definitely the incidences have increased threefold over the past two years. We have locked down Somali piracy, but we still have Nigeria and Southeast Asia heating up. Q: How much is lost due to piracy disruption each year? A: Hot [Well over] $100 million [billion] in losses and expenses. Q: Who is paying for that? A: We all are, really. Q: Are you saying that the Nigerian government is in cahoots? A: I don't have any direct evidence at this point in time, but i would say that they certainly make it difficult to protect themselves and the commercial vessels. Interesting viewing and a dose of reality in the world of Nigerian (and SE Asia) piracy/sea robbery. 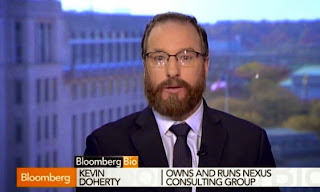 I like Kevin's pointed suggestion that there's a whole lot of corruption going on out there that makes some of the world less safe. One of the ZIM shipping company's cargo ships was attacked by pirates Wednesday afternoon in the Strait of Bab-el-Mandeb, adjacent to Somalia. Security guards stationed aboard the transport ship repelled the attack by the group of pirates who attempted to abduct the ship while in the middle of open waters. The incident occurred as the Israeli ship made its way from East Asia back to Israel. The ship sailed into an ambush when two pirate ships snuck up alongside the ZIM vessel, and the pirates attempted to get on board and take control of the ship. Been a couple of these "attempts" near the Bab recently. Map from the Live Piracy Map site of the ICC CCS IMB. In most cases of West African piracy, the pirates want the cargo, not the crew. This means levels of violence are higher than they are off the coast of Somalia, where the pirates need to keep the crew alive in order to obtain ransoms. Underwriters have designated the waters off Nigeria, Togo and Benin a "war risk area", pushing up insurance costs. This ultimately affects the cost of food, oil and anything else that is transported by sea from West Africa. Tune in to the BBC World Service at 19:05 GMT on Saturday 15 November to listen to the documentary Chasing West Africa's Pirates. It will also be available to listen to online or as a download. Description: 121100ZNOV14. A vessel has reported it was approached at speed to 100m by two skiffs in position 1236N 04325E. Each skiff had 2 people on board. No tripwires were sighted. Vessels AST showed arms and skiffs turned away. Vessel is safe. Vessel announced incident via ch16. Not sure how 2 blokes in 2 skiffs are going to jump a boxship doing 17.5 knots without weapons or ladders. 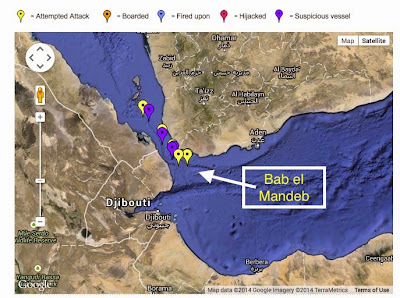 Highly likely to be fishermen but will be used by PMSCs to talk up the threat - business development by fear - like a number of these Bab al Mandeb reports. The ship itself is almost certainly the Maltese flagged MV Zim Sao Paulo (IMO No. 9389681) which was the only "Zim" ship in the area. This is listed as being owned by a Greek shipping firm Danaos Shipping. However, is does work on for Zim on the East Med / Black Sea Express Service (EMX).